Jason Strycharz was our wedding DJ. Throughout the entire process, from our initial meetings to the day of the wedding, Jason was extremely professional and accommodating. He took the time to meet with us on two different occasions before the big day to ease our minds and ensure everything would run smoothly, from the day of timeline, to introductions, to those special songs. He even made us a mixed CD of the sentimental songs he played that day. I chose to have some uplighting at our reception and Jason was willing to meet with me ahead of time (he even brought his uplights) so that I could see the color options and exactly what it would look like in the room. He definitely had a great deal of music knowledge and was able to guide us in choosing our introduction song as well as our cocktail and dinner music. I highly recommend Jason! We are so happy we chose him as the DJ for our wedding! Jason Strycharz was great to work with. My partner and I wanted to get people up and dancing, but weren't prepared to give someone a full playlist. Jason was able to help us select something traditional for the ceremony, some nice background music for cocktails/dinner, and then pleased our guests with some crowd favorites. It was clear throughout the process he has experience and likes his job. 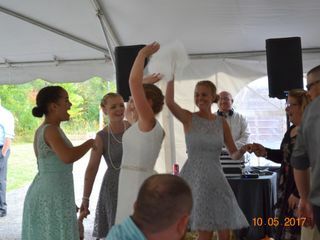 I was recommended Music Man DJ Service after asking a friend who is very knowledgable about New England wedding DJs if they could recommend someone who would do a great job for a great price and not be over the top and cheesy while on the microphone. I could not be more happy with this recommendation! I reached out to Music Man DJ service and within a few hours had an appointment set up with Mitch to talk about what I was looking for. We were able to meet with Jason S, our wedding DJ, the day of our initial meeting and my fiancé and I immediately knew Music Man DJ Service was the right choice. Jason is friendly, professional, and accommodating from the get go! As a wedding photographer myself, I just happened to be fortunate enough to shoot a wedding where Jason was the DJ just a few days after signing the contract. It was a unique but awesome opportunity to be able to work with Jason as a colleague and see him in action before my wedding day. I am so happy with my choice to go with Jason and Music Man DJ Service! He helped us finalize the timeline for our reception, choose key songs, and was skilled in reading the crowd and keeping the party going! Any time I need a DJ in the future I'll be reaching out to Jason and I'll be recommending him to anyone I know looking for a DJ! Jason S was incredible. He took the time to get to know us and what we wanted our reception to be. We provided few details and let him read the crowd and no one was disappointed. He kept things moving and the dance floor full! I highly recommend the Music Man DJ Service. 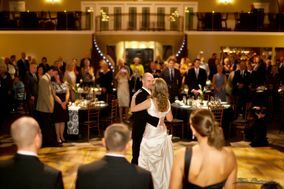 DJ John Edwards did a great job of DJing our wedding and being the master of ceremony! We had a great dance party and everything went very smoothly. Thank you!! We definitely recommend the Music Man DJ Service! Mitch was wonderful and very responsive getting in touch right away and getting us connected with our DJ Shawn! Shawn was AMAZING!! Very easy to get a hold of, very responsive, and flexible! He kept everyone dancing when we didn’t think we had a dancing crowd and he even jumped in to help with a little joke presentation I had planned and was the perfect assistant! He coordinated with my other vendors and the day just flowed perfectly!! Definitely recommend! The Music Man dj service did my sisters wedding and I knew I had to have them for mine as well. Ben and Diane are absolutely amazing. They were so nice and easy to work with, played the best music and helped keep me on track as it was a backyard wedding and therefore no wedding planner. Really can't say enough good things about them, an absolute must for anyone planning a wedding (or any other occasion). We were so happy with Jason! We were specific with a lot of the songs we wanted played and most, if not all of them, were not your typical wedding songs. We were given a form to fill out, which was helpful because it let us know just how much went into DJing a wedding. I even wanted to surprise my husband with the FSU war chant for our entrance and Jason was able to get that done! It was definitely a more club feel with more recent music, which was exactly what we wanted!!! Our guests had a blast and so did we! Picking Jason as our DJ was the best decision we made throughout the process. Everything he put in front of us was perfect but also the way he handled it all. He was very relaxed throughout the process, which made us relaxed as well. We gave Jason a super, super long list of music that we wanted and he made it happen!! We had so many compliments about the DJ at our wedding and afterwards. Shea and I are so thankful for you and your service!! Highly recommend this guy!!!!!! We had Jason Strycharz from Music Man DJ as our wedding DJ in June 2018 and highly recommend him. From our first phone call with him until the wedding day he was extremely organized, professional, and knowledgeable. He helped us determine the timeline of the day and pick out special songs. Our venue was complicated and required him to bring 3 different set-ups. He arrived early to set-up and test out all his equipment, and there were absolutely no problems! Everyone could clearly hear the toasts and speeches during dinner, and the dancing music he chose was a huge hit. I heard so many compliments on our DJ throughout the night! Many thanks to Jason and Music Man DJ! Mark thank you so much for the kind words. Yours and Jess's wedding was so much fun! You picked an absolutely amazing spot right on the water and I can't believe how much your family and friends danced. I personally loved your sparkler send off at the end of the night. It really tied the whole day together. I wish you both all the best! We had Jason Strycharz as our DJ for our wedding back in June. He was amazing, went above and beyond for us, and we would highly recommend him. 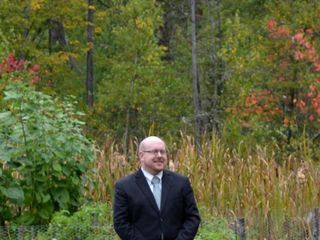 He was always available to answer questions (whether through email or phone ), and was great to work with throughout the whole wedding planning process. I had a very specific vision for the music for my wedding, and he 100% covered all the bases. From helping us lay out the timeline, to playing all the different preferred genres of music between me, my husband, and my father, Jason went above and beyond. Jason even went along with my weird request of having an "emo dance party" -- my guests and I loved it! We received so many compliments regarding the music. And at the end of the night, Jason gave us a mix tape CD of all our songs! It was such a nice touch. Thank you, Jason! You truly made our wedding day! Hire these people. Seriously! Because of these people, specifically Brian Phoenix, our friends and family deemed our wedding the wedding of the summer, (and it was only June)!! Quality of Service: Brian Phoenix provided us with the songs and music we requested, filled with other great tunes that kept our entire guest list on the floor the whole night. Responsiveness: Very timely about responding to emails, phone calls, or sending info/contracts in the mail. We never were waiting to hear from him. Professionalism: He showed up early. He was dressed to impress. He was incredibly polite to our guests, and even made friends with my uncle. Value: Great value! I felt that it was an appropriate amount for the awesome job that he did! We initially looked at other with higher prices, but I honestly do not think that we would have gotten as good of quality as Brian Phoenix with the Music Man DJ Service. Flexibility: Incredibly flexible. We need audio at the Portland Head Light for our ceremony, no problem. He walked us through what equipment would be needed, how we could plug in the musicians, and he did not appear to think this additional time was burdensome in the least. Shawn Cullen was the BEST DJ (hands down!). Shawn was professional, timely, and accommodating as we planned for our February 25th winter wedding. We had a live musician for our ceremony and cocktail hour. When we met ahead of time, Shawn coordinated and worked with the live musician to make sure that everything went seamlessly. Shawn's breadth of experience helped to guide us in the right direction to ensure that we included all of the important details. My fiance and I weren't very specific about certain songs, however, my only request was that Shawn played songs that would keep people dancing. Boy, did he deliver! Shawn played all the greatest dance party hits from each generation. I couldn't leave the dance floor! Shawn was incredibly 'in tune' with our crowd and was able to read the personalities and seamlessly think, adjust and adapt on his feet to play the perfect song for the moment. At one point a cowboy hat entered the dance floor. Shawn began playing the best country songs! I would recommend Shawn for anyone who is looking to have a crowd on the dance floor all night long! Thank you so much Shawn, you made our wedding night unforgettable! Diane and Ben were amazing! They knew just what to play and were very helpful! Always prompt in responding and great throughout the wedding day! Highly recommend these guys! Ben and Diane were the DJ's for our wedding on 10/7/2017. They were AMAZING! They were completely responsive and professionsal throughout the entire process and didn't miss a beat. Everyone was completely engaged with their music and danced the entire time. I gave them simple genres to play within and they were able to put togeter the perfect playlist for both dinner/reception, aswell as the dance party to follow! I couldnt have asked for better service or wedding reception because of them! It was simply perfect! Mitch was my initial contact for our wedding event. He was very responsive, professional and fully willing to work with all of our wants and needs. Mitch eventually hooked us up with Jason as our DJ once all the details were finalized. Jason was amazing! We met at our home to exchange details, ideas and to fine tune the program. Jason was very polite and down to earth. Kind of like a perfect match. Most of the music was hand picked by yours truly but there was gaps that needed to be filled and Jason did a wonderful job with the criteria we provided. All of our guests gave GREAT reviews and loved the music/entertainment. I have to admit that one of the most memorable moments during the whole day was when I was waiting ever so impatiently for my wedding party to make their way down the aisle.... Jason and I made eye contact through the door, from 2 stories up. I got the feeling he could tell how anxious I was and that I might bolt too quickly. He gave me a wink and a non nonchalant thumbs up. That was a small but very significant moment of relief knowing that he would give me the go, and he did. It was perfect. He totally had my back from start to finish and I couldn't be more thankful. He even made us a CD of the special songs. I would fully recommend The Music Man to any and everyone. Thank you so much Jason, we both appreciate everything you did to make our wedding day the best that it could be. what our needs were and matched us accordingly with the right DJ. Jason, our DJ was incredible. He coordinated with me via email and was so kind and flexible regarding last minute changes. 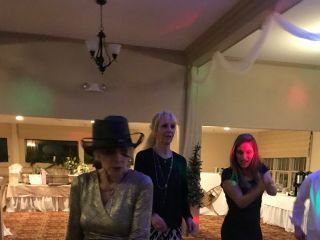 He kept our dance floor moving and as a result our guests had SO much fun. I almost cried tears of joy at the end of the night when he presented us with a burned CD of our music from the night. I'd give these guys 10 stars if I could. We LOVED Barbra (DJ Vortex)! She was so easy to work with and gave us a great mix of music to keep our dance floor busy. Based on the songs we told her we liked, she gave us a great eclectic mix and worked with us to make sure that we would have enough energy to power her system, since we were on a private residence. We also had her MC the event, which was buffet-style, and she did an excellent job of letting our guests know what was going on and keeping our dance floor full. We had so many guests tell us how much FUN they had and Barbra played a big role in setting the atmosphere. Definitely would recommend her to anyone looking for a DJ for their wedding! We booked Barbra to DJ our wedding and she was absolutely amazing! Barbra was so responsive over the past few months prior to my wedding. We spoke on the phone, via email, etc. She was so accommodating when it came to us choosing some specific songs that we wanted for the ceremony. She also helped us setup the microphone for the ceremony. She picked songs throughout the night that we requested but also made sure the crowd was enjoying the music and dancing all night! I had SOOO many guests ask me for her information at the end of the night because they said "The DJ was AWESOME" and that she was! Not only that, Barbra sent us home with several CD's from the all music she played from the ceremony to our last song of the night! My husband and I could not believe that she did this for us the night of our wedding. It is so special that we now have all this music! Barbra is the best and highly highly recommend calling the Music Man! Caren Collins was our DJ for our First Ending Hunger Gala. She was very professional and so accommodating and friendly. She took all requests and knew how to set the proper music for the proper moods. She was very professional on the microphone and kept the evening flowing. She had all the equipment she needed and kept her station looking clean. I would definitely love to have her for a DJ again. Mike did a wonderful job. He made the right decision with all music choices. I would recommend Mike for any occasion! We were lucky enough to get Brian Phoenix for our wedding DJ. He was prompt with getting back to us and answered any questions we had. He played great music and got people dancing. If you book the music man be sure to as for Phoenix! !